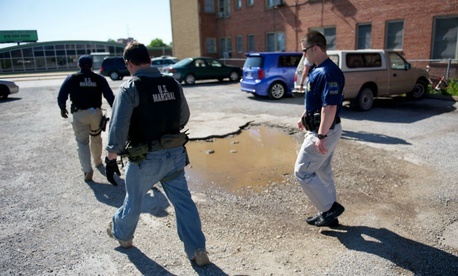 The Marshals Service, a part of the Justice Department with 5,100 employees spread over 94 districts, tracks fugitives, provides courtroom security, transports prisoners, seizes illicit assets and partners with local law enforcement in investigations. The 230-year-old agency in recent years came under tight scrutiny from Sen. Chuck Grassley, R-Iowa, during his tenure as Judiciary Committee chairman, in which whistleblowers exposed cronyism in hiring, mismanagement and a “frat culture,” a lengthy recent report said, providing context for this new employee complaint. The 46 who recently complained to OSC and have retained outside counsel are among 60-plus nonsupervisory inspectors with the rank of GS-12 who are assigned to the agency’s regional task forces in the Investigative Operations Division. The proposal to elevate these GS-12s has been pursued at the highest levels of the Marshals Service since 2008, this complainant noted, providing copies of correspondence. “Our previous director John Clark found the money to implement the upgrade and obtained the blessing” of the Office of Personnel Management and the deputy attorney general. But it never happened. Also pushing for the upgrade for the past five years was the Federal Law Enforcement Officers Association. In 2013, “we almost got it done” but for the government shutdown that year, National President Nate Catura, told Government Executive. His group has met with the acting Marshals Service director David Harlow and the attorney generals under presidents Obama and Trump. But with the overall ripple effect, “it will take an act of Congress,” and they’ll have to increase the budget by, according to one study, $50 million, he said. Kristin Alden, a partner in the Alden Law Group in Washington representing the nonsupervisory inspectors, told Government Executive the problem is that reclassifications can be done either at the request of the individual employee to a human resource specialist, or, more rarely, by OPM. That agency can perform interviews and surveys in a “desk audit” to determine whether a promotion is deserved because of an inaccurate position description or because of an “accretion,” or increase, in duties. A desk audit does not provide back pay and is not appealable. OPM referred Government Executive inquires to the Justice Department, and an Office of Special Counsel spokesman said the agency couldn’t comment. So what is the resistance to the plan? Grassley’s staff members in their own narrative were unenthusiastic that upgrading the GS-12s was even being considered. “It is troubling that the agency was ready to expend the funds to promote 60 people with no competition, while ignoring pleas to replace body armor with a 13 percent failure rate currently worn by thousands of operational employees across the agency whose daily job it is to apprehend violent fugitives,” their report said. What the GS-12s seeking elevation aren’t considering, according to Jason Wojdylo, the Interim Chief Deputy U.S. Marshal in Chicago speaking as the Federal Managers Association’s Vice President for Law Enforcement Operations, is that “they don’t supervise,” by OPM’s definition. Such warnings against favoritism were expressed in the letters the Federal Managers Association’s leaders sent to both the Marshals Service and Congress, including one in April 2017 in which the estimated cost of elevating the complaining GS-12 inspectors was put conservatively at $300,000. While opposing the plan to elevate the group of 60-plus inspectors, the managers association has also criticized a “structural” problem: “the unsustainable depletion of staff in districts compared with what appears to be disproportional growth of headquarters,” Wojdylo said. “The attempt to elevate just 2 percent of the workforce added to the strife between Deputy U.S. Marshals assigned to the 94 district offices and 218 sub-offices, and those assigned to 14 headquarters’ units. “There have been repeated recommendations by the Federal Managers Association, as well as from peers within the agency, to improve staffing levels in district offices,” Wojdylo said. His organization cites statistics that reflect a bigger bureaucracy at U.S. Marshals Service headquarters year after year, with net losses to district offices resulting from merit promotion of 201 positions over the last three calendar years (44 operational positions in 2016, 86 in 2017, and 71 in 2018). One data set comparatively reflects growth of nearly 150 percent in headquarters’ units since 2000, prompting the association to call for “an immediate moratorium on hiring at the headquarters level.” Yet, upcoming merit promotion career boards scheduled in March and April have 22 positions announced for district offices and 27 for headquarters’ units, he said via email. “History shows we most often see positions assigned to headquarters filled from district office candidates in far greater numbers. We again should anticipate another net loss to our district offices,” he warned. Everyone in the service is for “one badge, and we all wear the silver star,” Wojdylo said. But the “silo-building in Washington” shortchanges field offices in resources. Headquarters’ units, the association notes, are not subject to a staffing model that caps district offices at 76 percent of what is considered the maximum for a safe work environment for managing core missions involving detention operations, and judicial security. “The latter includes the protection of federal judges and prosecutors,” the managers association said. Any resolution to the fight over upgrading the GS-12s on the Regional Fugitive Task Forces will impact the service’s larger efforts to honor both fairness and merit principles for promotions. A 2017 Government Accountability Office study credited the Marshals Service with taking steps to improve its programs “to ensure a systematic means of selection for promotion based on merit.” But it concluded that the agency lacked documented evidence and “does not adequately monitor” the ratings process for applicants seeking promotions. Catura, of the law enforcement group, said the outcome has to wait for a new, Senate-confirmed director. After the retirement of acting director David Harlow, President Trump last October nominated Louisiana attorney Donald Washington for the challenging post.